We made it to Iceland! We landed Friday morning and have been busy having fun (and seeing great geology). Our chefs have been cooking excellent meals. 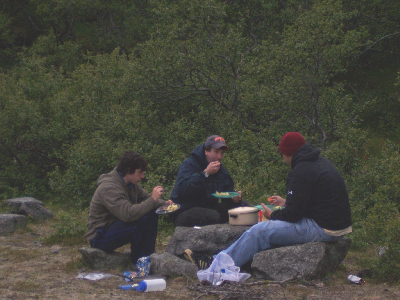 Adam, Rob, and Todd eating their awesome salmon dinner on the first night. All of the food has been fantastic, especially the cheese. Todd likes it so much, he bought a whole block of it for himself! 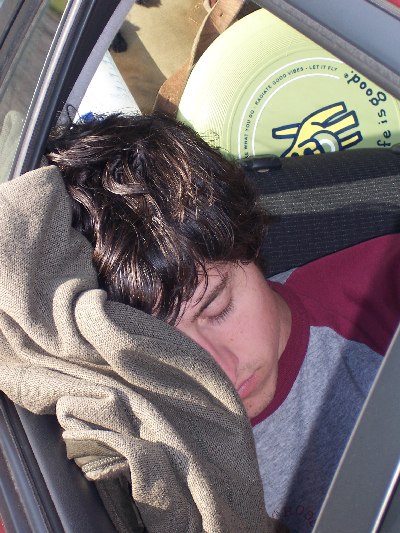 Rob and Todd have eaten fish for every meal and plan to continue for the entire trip. As soon as we landed, we traveled along the southern coast to meet a group of geologists on a field trip. We’ve seen glorious columnar joints, complicated intermingled granophyre and basalt, and highly altered hyaloclastite. We also ventured all over a glacier, where we drank some melt water and stood in a glacial cave. 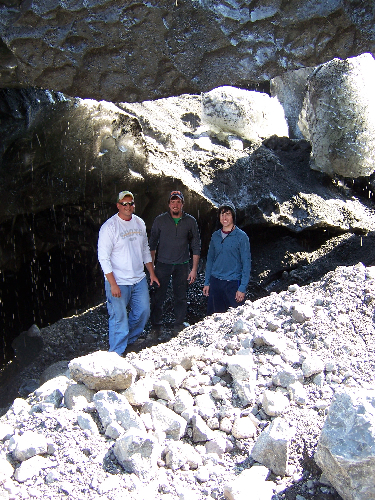 Todd, Rob, and Adam standing in a glacial cave. 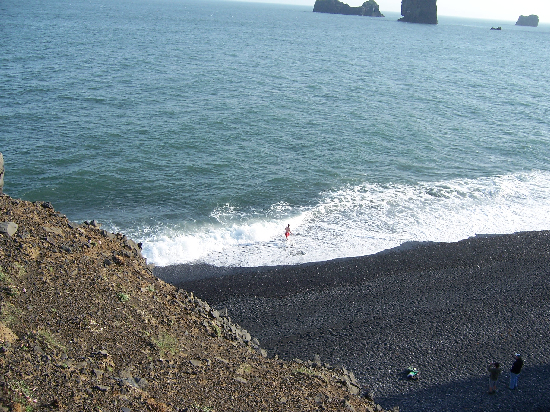 At one stop, we walked along a black sand beach. Well, most of us did. Todd and Rob made rock sculptures and signed the sand. 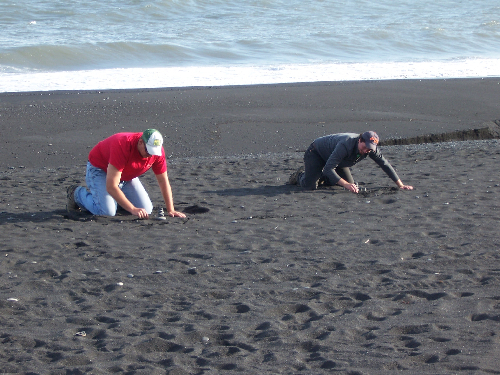 Todd and Rob on the black sand beach. Just down the road, we visited the Dyrholaey bird sanctuary. 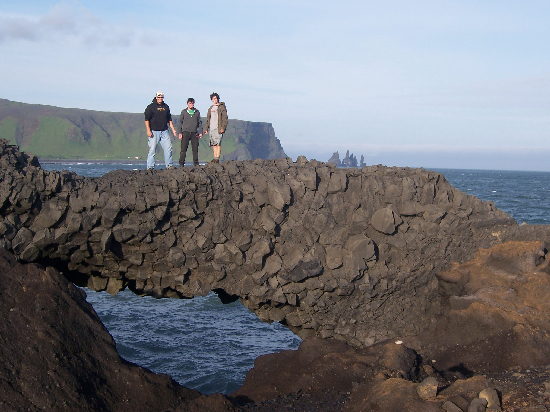 The basaltic lavas and hyaloclastites have been carved into interesting shapes by the crashing waves. Todd, Rob, and Adam on a VERY stable rock bridge. Hyaloclastites are glassy fractured rocks formed when lava erupts explosively in water. One of us attempted to find the source of the lava…in the COLD Atlantic ocean. Rob (in the red trunks) searches for the lava source while his comrades (lower right corner) observed his methods and took notes. They concluded that they should not follow. In Hveragerdi, we observed the effects of the hotspot in action. We hiked along a trail that had fumaroles, hot springs, and mud pots. 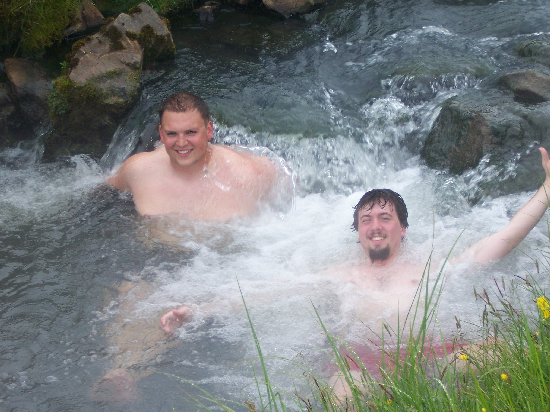 The local stream is heated by drainage from the hot springs and serves as a natural hot tub. Todd and Rob soaking in an Icelandic stream. We’re in Hafnarfjordur tonight, staying with Steina, one of our Icelandic colleagues. Tomorrow starts our field work – we’re headed to Todd’s site: Undirhlithar.